The Active WebCam work area contains some panels that you can show or hide to get a more comfortable working place. 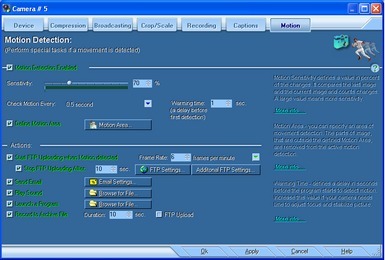 The Camera Window is used to control and preview camera. The Log Panel collects a history about events and errors. It helps to troubleshoot a broadcasting process. The Viewers Panel collects a history about viewers IP addresses and node names. The Gallery Panel shows small images of recorded files. You can select Local camera (frame grabber or USB camera), Network camera (Axis®, D-Link®, etc. 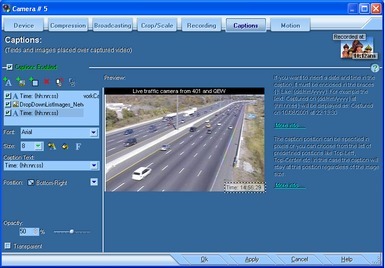 ), or Remote computer (another Active WebCam program launched on remote computer with video capture device). Also you can set up a cycler that periodically changes video device after a predefined number of seconds have passed. 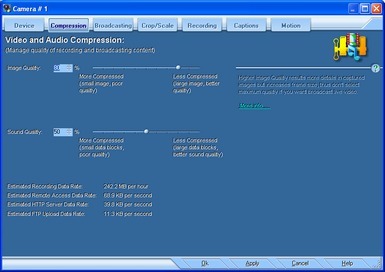 You can set up image and sound quality by changing the compression level. 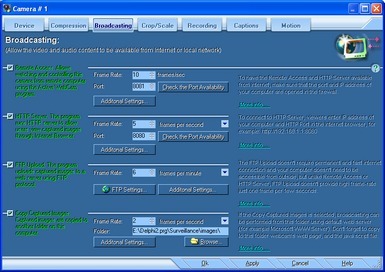 These settings are used to prepare content for broadcasting and recording. Higher image quality results more details in captured images but increases frame size. 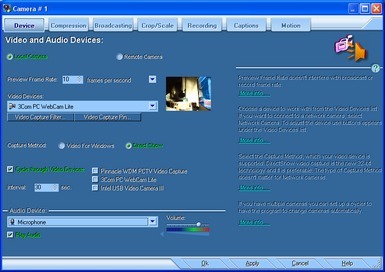 Remote Access - allows other computers access the camera using the Active WebCam program. HTTP Server - the program runs HTTP server. FTP Upload - the program uploads captured images to a web server using FTP protocol. Copy Captured Images - the program copies captured images into a folder on your computer. You can use Active WebCam to record a stream of full-motion video and audio from your video and audio sources. The program has the following recording features: Live Recording, Archive Recording, and ability to create Archive of Snapshots. The program has features to place text captions, date/time stamps, and image overlays on each video frame. When the program detects motion in the monitored area, it can sound an alarm, e-mail captured images, start FTP uploading, record video clip, pop-up main window and make it active, start snapshots creation, or even change recording and broadcasting quality. You can watch the viewers IP addresses and node names. The program keeps log of all viewers IP addresses and node names. This information can be printed or saved to a file. The Pan / Tilt / Zoom panel allows you to control all camera's movements, i.e. panning & tilting your camera to any desired location by simply pressing the appropriate button. Video Conversion tool helps you edit video clips and convert them from AWLive format to AVI and MPEG files. If you want to protect a file with password (or remove password), select the AWLive as destination format and enter the password. Comprehensive player helps you easily playing-back archived files and quickly navigate inside the clips by clicking appropriated thumbnail. You can change the playing-back speed, as well as copy, save, and print any video frame.